Last month I sat in a seat for six hours and didn’t earn a single AAdvantage Mile. It wasn’t because I was traveling on an award ticket, it was because I was taking defensive driving. I searched the AAdvantage eShopping Mall, AA.com, the forums and the web: I had no luck finding a defensive driving school that offered AAdvantage Miles. So I started to fantasize….wouldn’t it be nice if I could earn a couple of thousand miles for enrolling in defensive driving…..or better yet, wouldn’t it be nice if the City of Dallas offered some kind of AAdvantage Miles bonus when your enroll in traffic school…. I recognize that it might diminish the deterrent effect…but it was just a fantasy. Anyway, that brings me to reader giveaway. Thanks to the generosity of a reader (thank you WIS!) 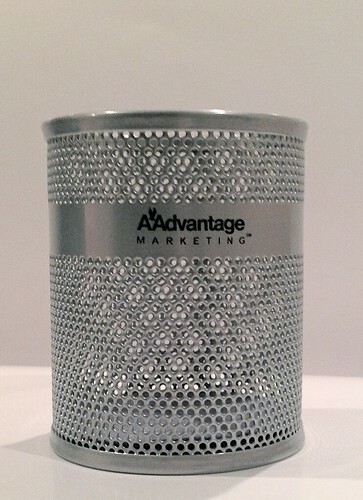 I have a 10% AA discount code, and thanks to the generosity of the AAdvantage team (thank you! 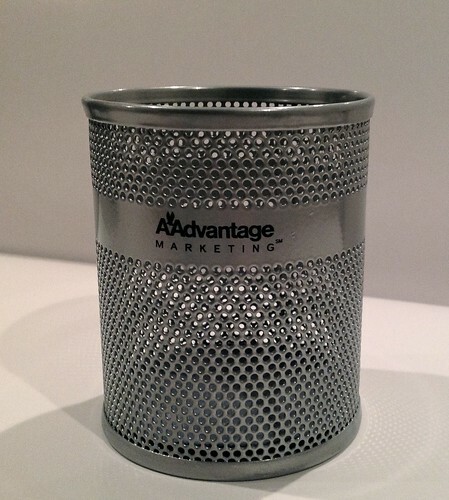 ), I have an AAdvantage logo pencil/pen holder to give away. To enter, just share your fantasy AAdvantage bonus offer in the comments section. There’s no correct answer, just keep it clean and tell me what kind of offer you’d wish existed. I’ll have a random drawing on Monday. One entry per person. The deadline to enter is Sunday, August 5, at 11:59 PM Pacific Time. Paying for childcare/daycare tuition earning you bonus miles would be nice. United used to pay double for education few years back and getting Children and entire family hooked on to a single frequent flier program is genius. I’d be pretty happy if AA offered 1.5x EQMs for F, rather than just EQPs. I’d like it if they bring back the 500 (?1000) AAdvantage bonus miles for checking in on AA.com. I think this deal existed years back, or am I just dreaming? Also a return of some non-flying Million Miler would be nice. Yeah – the opportunity to earn miles for paying rent/mortgage without incurring a fee that negates the value. I agree with Mortgage. Come on Bank of Am improve your customer experience! Miles for purchasing tickets online. Earning AA miles for school tuition payments for the kids. I think the mortgage payment goes without saying! Paying rent/mortgage would net a ton of miles! Definitely getting miles for paying rent (without a $25/month fee), as that would really add up the miles fast! If my checked luggage (yes I do it 1 or 2 times a year)with priority tag isn’t delivered within 20 minutes (like AS) should get choice of miles or discount coupon or voucher or 2X $ back if you paid to check the bag. More double EQMs, for sure! Miles for working. Pay me in miles!!! Miles for every movie you watch at a movie theatre. Since so many people have mentioned mortgage already, I think it would be great if AA ran a promotion like United did with “month of miles”…. It’d be nice if they had special upgrade passes that would be for a promotional sale that’d allow you to upgrade any purchased ticket to a first or business class seat on any itinerary you have one way. So for example: I buy one pass (maybe as a black friday special or happy no longer in bankruptcy day), and I can use it one way to upgrade from here to Asia even though my round trip ticket was booked in lowest price economy. Another vote for mortgage payments earning miles. Second choice would be a few hundred bonus miles for buying tickets online. I dream of miles for honey-do’s. Maybe once I build up my wife’s accounts she will put that into effect. How about some points if you’re attending an event at either the American Airlines Arena (in Miami) or the American Airlines Center (in Dallas)? I don’t live in either city, but do travel a lot to see sporting events. Maybe have a couple of check-in machines inside the arena like they have at the airport. Once you enter the arena, you can go to the machine and get some bonus points. Miles for daycare expenses. I spend more on daycare than my mortgage right now. I agree with the mortgage payments! I also think that all bonus categories should be opened for AA Citibank credit card account holders – not just certain people who are specifically targeted. If x is getting an offer for 5x groceries, why shouldn’t I? Also bonus miles for checking in for flights on time!! How about a bonus miles multiplier scratch-off area on the front of every boarding pass? Miles for paying your taxes or tuition without the convenience fee. A mile for every minute you spend standing in any AA related line, double miles for every minute waiting for their never on time flights, and triple miles for every minute you sit in one of their planes and it is not moving. Miles for paying your mortgage. AA miles for paying my mortgage… and riding the T in Boston everyday, to and from work! A mile for every time someone stops at the top of an escalator when I am behind them. 100 miles for every coffee I consume! Bonus miles certificates that flight attendants could award on the spot to kind passengers they see helping others. Getting miles for paying my life insurance. Miles for donating to any approved 501c charity, not just the 3 american promotes. Double EQP’s and EQM’s, not just EQM’s. Miles for each dollar that a ticket purchased on AA exceeds a competitors lowest base fare on the same day for the same origination and destination route and travel dates. Probably impossible to administer….so an ideal fantasy. Miles for early/online/kiosk check-in, miles for low baggage weight. Both reward customers for helping the airline save money. Definitely for paying for a mortgage and about to start building a house so wish we’d get miles for the labor cost. Any promo involving enough miles that allow you to do something with them, a.k.a. 500,000 miles!!! Return of the credit card spend million miler miles would be fantastic.